"Always remember you're braver than you believe,stronger than you seem, and smarter than you think & loved more than you know"
This quote, being spoken by a fictional character. This quote is urging us to remember, we truly are braver, stronger and smarter than we might admit. In our crazy, work-a-day world, we adults often forget this little bit of advice. We become timid, more afraid of what we have to lose than what we might gain. We become subservient, forgetting our inner strength. We become dull and habit-bound, forgetting our intelligence and our resourcefulness. We forget our true selves, or allow them to become so distant as to be mere stories, dreams, or faded memories. We are admonished by the quote to always remember. 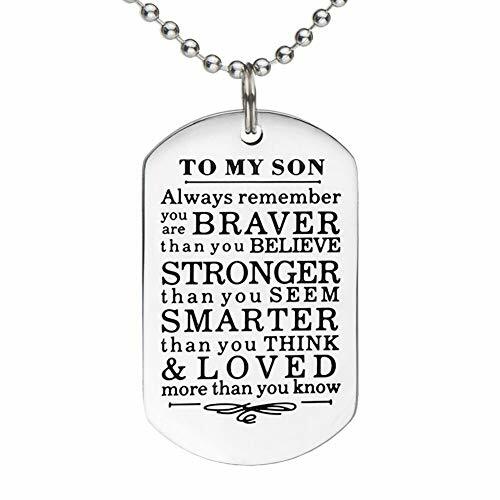 INSPIRATIONAL WORDS- Reminding you that you are "Braver, Stronger, Smarter and Loved More Than You Know". Perfect for your kids who want to encourage. STAINLESS STEEL- High quality, hand polished on double sides, resistant to corrosion, hypoallergenic and and won't tarnish. PERFECT KEY RING GIFT- Available for most occasions, such as Graduation, Birthday, Thanksgiving Day, Wedding, Christmas and so on. EXQUISITE & THOUGHTFUL- The Necklace looks gorgeous, and can also be used as keychain pendant. Coming with a black box, which is practical as a decent gift. OUR PROMISE-100% full money back if you are not satisfied with our products for any reason. If you have any questions about this product by Eunigem, contact us by completing and submitting the form below. If you are looking for a specif part number, please include it with your message.